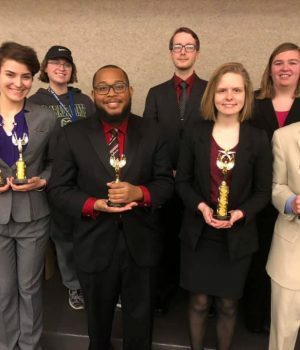 The Highland Community College Forensics Team traveled to Northern Illinois University this past weekend to compete in the Illinois Intercollegiate Forensics Association State Tournament. HCC competed against all the community colleges and four-year universities within the state of Illinois and placed in the top five, earning an impressive fifth place overall team trophy and five individual awards. Coaches Brit Williams and Bill Lucio, long-time Forensics vets who met on their speech team for the first time back in 2008 when their coach put them in an event together called DUO, reminisced about their State Tournament experiences. “It was so cool to be back at State and see all the coaches who helped mold me into the educator I am today,” explained Public Speaking Instructor and Director of Forensics, Lucio. “I remember taking our DUO to State back in 2009 and winning second place. It was such an amazing experience as a competitor and it’s so cool to be on the other side, watching our students have these similar experiences of success,” added Assistant Director of Forensics, Williams. Team Captain and sophomore Alec Aurand placed fifth in Extemporaneous Speaking and third in Impromptu Speaking, freshman Luthien Jonis placed sixth in Dramatic Interpretation, and Sophomore Maggie Finazzo placed second in Dramatic Interpretation and third in Poetry Interpretation. The team is scheduled to travel to Prairie State College in Chicago Heights in two weeks to compete at their Regional Tournament as they continue to prepare for their National Tournament in Reno, NV this April. To see the speeches and performances that have been earning the HCC Speech Team students awards all year, the HCC Speech Team would like to invite you to their Nationals Showcase on Thursday, March 28th in M-120 from 4 p.m.-5 p.m.